Of what real threat to US security was Saddam Hussein? The answer is none. Ever. Of what real threat to the US is Syrian president Bashar Assad? The answer is none. Is ISIS a threat? Obviously yes, but not to the degree imagined. US policy on Syria is centered on the removal of Assad in Syria even though Assad is no threat, but ISIS is. And it was the bungled removal of Hussein that destabilized Iraq and directly led to the creation of ISIS. In October, I noted former UK prime minister Tony Blair (who joined president Bush on the inane takeout of Saddam Hussein), Issued an Apology for Creation of ISIS. Our allies ought to be those who want to fight ISIS, not alleged "moderate" Al Qaeda forces seeking to destabilize Syria, creating a refugee mess in the process. Pat Buchanan asks (and correctly answers) the question Is Putin Our Ally in Syria? The President’s strategy is to contain, degrade and defeat ISIS. While no one has provided the troops to defeat ISIS, the U.S. is using Kurdish and Yazidi forces, backed by U.S. air power, to degrade it. The Kurds have run ISIS out of Kobani, captured much of the Turkish-Syrian border, and moved to within 30 miles of Raqqa, the ISIS capital. Yazidis and Kurds last week recaptured Sinjar in Iraq and cut the highway between Mosul and Raqqa. The terrorist attacks in Paris, the downing of the Russian airliner in Sinai, the ISIS bomb that exploded in the Shiite sector of Beirut, are ISIS’s payback. But they could also be signs that the ISIS caliphate, imperiled in its base, is growing desperate and lashing out. Yet consider the Republican strategies being advanced. The Kurds excepted, Gov. Romney ignored all the forces that are actually fighting ISIS: Russians, Hezbollah, Iran, Bashar Assad, the Syrian army. Mitt urges instead an alliance of countries that have done next to nothing to defeat ISIS. Sens. John McCain and Lindsey Graham want U.S. ground troops sent into Syria and Iraq. But as Turkey has an army of 500,000 next door and Assad’s army would happily help wipe out ISIS, why not let Arab and Turkish boys do the fighting this time? 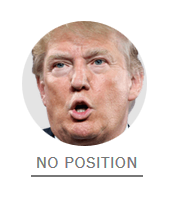 “America must lead,” is Jeb Bush’s mantra, and he wants U.S. boots on the ground and a no-fly zone over Syria. “We should declare war,” says Bush. Why then does Bush not call up Speaker Paul Ryan and Majority Leader Mitch McConnell and dictate the war resolution he wants passed? And whom does Jeb propose to fight? Why declare a no-fly zone when ISIS has no air force? Does Bush plan to shoot down Syrian planes flying over Syria and Russian planes flying in support of Assad? New Jersey Gov. Chris Christie is ready to rumble. And if Russia violated his no-fly zone? “Then you take him down,” said Christie, meaning we shoot down Russian jets. But what vital interest of ours has ever been so engaged in Syria as to justify a major war in the Middle East and a military clash with a Russia with a nuclear arsenal as large as our own? In any war it is usually wise to enlarge the roster of one’s allies and reduce the roster of enemies. If ISIS is the implacable enemy and must be annihilated, we should welcome all volunteers. If Putin wants to enlist in the war against ISIS, sign him up. Jeb Bush - Republican Candidate: "Enforce that no-fly zone, and we’ll stop the regime’s bombing raids that kill helpless citizens. Ben Carson - Republican Candidate: "I would establish a no-fly zone along the border with Turkey. In no way would I back off." Chris Christie - Republican Candidate: "My first phone call would be to Vladimir, and I’d say to him, ‘Listen, we’re enforcing this no-fly zone’"
Hillary Clinton - Democratic Candidate: "I personally would be advocating now for a no-fly zone and humanitarian corridors to try to stop the carnage on the ground and from the air." Carly Fiorina - Republican Candidate: "This is a tricky maneuver, it’s a dangerous maneuver, but it’s a maneuver that we must undertake." Lindsey Graham - Republican Candidate: "I don’t know if there’s anybody left to train, but a no-fly zone would be a great relief to the Syrian people." John Kasich - Republican Candidate: "Now is the time for the United States to provide the moral leadership that it has so far failed to provide." Marco Rubio - Republican Candidate: "The United States should work with our allies, both Arab and European, to impose a no-fly zone over parts of Syria." Every one of the above is unfit for president, for multiple reasons, but foreign policy is the standout here. Let me ask again: Who is the threat? Note the similarity between the positions of Jeb Bush and Hillary Clinton. Bush is concerned about "killing helpless citizens" while Hillary wants "humanitarian corridors to try to stop the carnage on the ground and from the air." The irony in those statements is Syrian civilians are dying directly as a result of US policy of arming Al Qaeda rebels, US policy that created ISIS, and US policy of weapons handouts that fell into the wrong hands. Please consider this amusing Fact Check on Immigration. Pouncing on controversial comments about Mexican immigrants by Donald Trump, Hillary Clinton said in an interview with CNN on Tuesday that the ideological space between Trump and Jeb Bush on the issue of immigration was small. Clinton, the Democratic frontrunner for president, said while she would like to see immigrants have a path to citizenship, Bush, "doesn't believe in a path to citizenship." But the former Florida governor -- seen by many as one of the most pro-immigration reform Republican candidates -- has repudiated Trump's comments. And Tuesday, his campaign rebuffed Clinton, saying Bush supports a path to "earned legal status." Bush this year has also backed a pathway to citizenship for children eligible under the DREAM Act who were brought to the United States by their parents. Bush's attempt to navigate the nuanced waters between "earned legal status" and a path to "citizenship" is what makes Clinton technically correct in her assertion to CNN that he does not support a path to "citizenship." Bush's campaign is also right that Clinton did tell CNN a year ago, in the wake of a flood of unaccompanied children crossing the southern border, that they "should be sent back." It's a comment that her now-Democratic rival, Martin O'Malley, has also seized upon. Both Bush and Clinton are talking out of both sides of their mouths, with one side saying essentially the same thing as their counterpart, the other side blasting their counterpart for inconsistency. There is no real difference between the two on immigration. They may also argue about health care, but neither will do a damn thing to fix it. Clinton and Bush hate each other, but perhaps they should be on the same ticket if only they can resolve wide differences on abortion and guns. 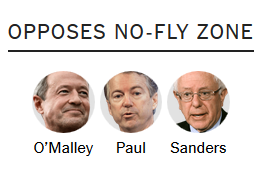 With the Bush-Clinton diversion out of the way, let's check out the New York Times article Presidential Candidates on Syrian No-Fly Zone. Rand Paul says "Setting up a no-fly zone is a recipe for disaster. It’s a recipe for confrontation," while predicting it could lead to World War III by causing a confrontation between the United States and Russia. Trump says "I want to sit back and I want to see what happens." Mr. Trump said he likes the idea of a “safe zone” being established in Syria. But he has questioned the idea of supporting rebels who oppose President Assad, and he has welcomed the idea of Russia attacking the Islamic State. Welcoming help from Russia is certainly the right idea, as is questioning the backing of alleged moderates seeing to overthrow Assad. His statements are also more consistent with those who oppose a no-fly zone. Trump appears to be mainly correct, while Chris Christie's and Jeb Bush's war ideas are extreme lunacy. Undoubtedly, Hillary supports war as well, whether or not she says otherwise.